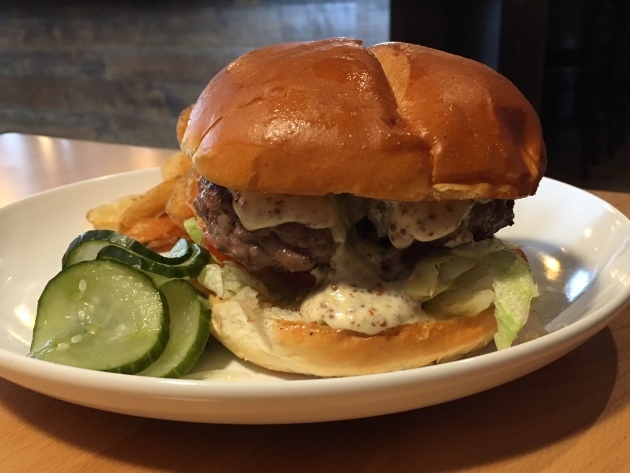 The burger: Because he's a die-hard fan of the Culver’s ButterBurger, it doesn’t take a rocket scientist to see where chef Asher Miller got his inspiration for the burger at Book Club, his appealing new southwest Minneapolis restaurant. Here’s how it works: a few seconds before they’re pulled off the griddle, each patty gets what Miller characterizes as a “big chunk” of a butter that’s infused with lemon, tarragon, parsley and chives. As the butter melts, those flavors sink into the patty, enhancing its flavor and texture profiles. It’s true: butter really does improve everything it touches. This much he knew: the formula would include grass-fed beef. After much research and experimentation, he landed on a brisket-shoulder clod blend from Peterson Craftsman Meats. “Their beef comes in fresh, not frozen, and there seemed to be a more consistent meat/fat ratio in their brisket,” he said. For those into numbers, Miller said that the brisket/clod ratio is roughly 70/30, and the overall meat/fat ratio chimes in around 80/20. Miller wanted to perk up the beef’s flavor, so he folds in fresh thyme and garlic. The thick, wide patties tip the scales at 6 ounces, and they’re seasoned with salt and pepper before hitting the flat top grill. I requested medium rare, and the kitchen hit that mark, precisely, a gently charred, slightly crisped-up exterior that yielded a pink bordering-on-crimson interior, with lots of juices, and a rich, yes, buttery finish. The bun? Miller said he and his crew tasted an “ungodly” number of potential buns until landing upon the winner, baked at Denny’s 5th Avenue Bakery in Bloomington. “Its texture and size really works for us, and I also like it for its longevity,” he said. Finishing touches are chosen to align with Miller’s desire to layer in flavor whenever possible. Most notable is a healthy splash of tarragon-infused mustard. Pickles provide crunch and a sharp (and much-needed) palate-cleanser. Oh, and there’s a reason why shredded iceberg lettuce and tomato -- both are enhanced by a bit of flavor-awakening salt and pepper -- are placed under the patty. “With a butter burger, if you’d put them on top of the patty, with the butter melting down on it, they would get muddled,” he said. One of this burger’s most noticeable characteristics is what it doesn’t have. Namely, cheese (frankly, with all that butter, the lack of American, Swiss or other dairy case staple is almost welcome), a somewhat radical departure in the Cheeseburger Era in which we find ourselves. Fries: Not included (they’re an additional $2). Instead, the burger is served with a handful of crispy house-made potato chips. Address book: 5411 Penn Av. S., Mpls., 612-822-5411. Open 11 a.m. to 10 p.m. Mon.-Thu., 11 a.m. to 11 p.m. Fri., 9 a.m. to 11 p.m. Sat. and 9 a.m. to 10 p.m. Sun. Yes, the burger is served during weekend brunch.